These dissections of human organs are an excellent aid to learning in the classroom. Each stamp comes with a Teacher's Guide featuring information about the organ and it's parts and suggesting extension activities and assessments. 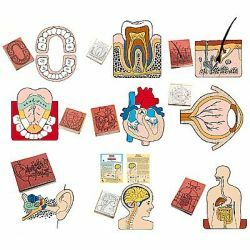 Rubber stamps with wood handles each include a full-color teaching guide with background information and many activities. Stamp sizes range from 3 1/2" x 3 1/2" to 3 1/2" x 4 1/2". 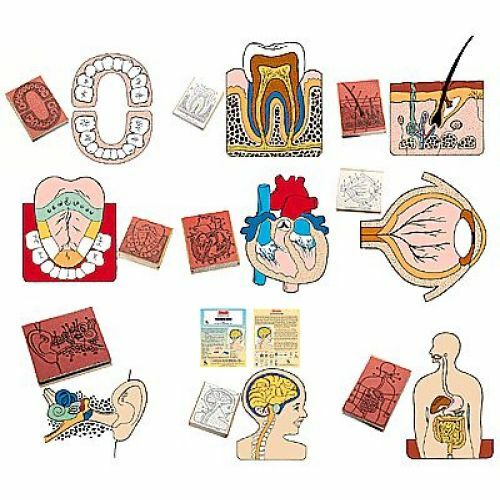 Anatomy Set of 9 includes: Toddler's Teeth, Tooth, Human Skin, Tongue, Heart, Eye, Ear, Brain and Digestive System.